Each Disk Pack was born after years of improving studies and cooperation within ceramics, in order to meet all requirements and to solve problems caused by different types of enamel and cabins. FM experience in glazing field guarantees to the customer the appropriate technical advice, in order to select the right Disk Pack according to the cabin, enamel, tile and effect to obtain. Belt Supports, Blade Holder Supports, Clips and many other Supports that can provide different solutions to build an internal transport line, using a few tools and in a simple and effective way, as they have been designed to be modular and applicable to any metal profile. All products are made of plastic material and some of them are reinforced with co-moulded metal inserts, in order to ensure a high load resistance and durability. Protection against accidents in thermoplastic material are useful to safeguard the moving parts that constitute a danger to the worker. 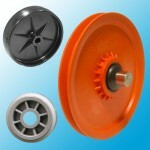 The range includes: Cases, Finger guards, Handguards and Plugs for Pulley’s slot. Belt Supports and Guide systems in iron, anodized aluminum or with part of polyethylen to ensure a long lasting and sliding. 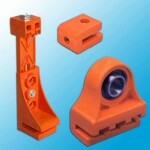 Thanks to the cooperation between FM and Röchling, sections in Diamond Plus material in orange color (exclusively distributed by FM) are now available: a high molecular weight polyethylene with exceptional characteristics of fluency and wear resistance, with an additive that guarantees hardness, appropriate for the use in applications with high abrasive dust. Roller Conveyors are a valid solution to the problems of handling and /or lateral containment of the transported tiles. 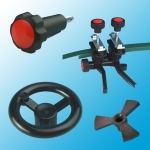 Thanks to modularity and “easy assembly“, they can be quickly applied on all handling systems. 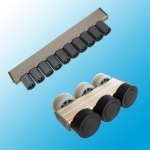 Roller Conveyors are equipped with different types of aluminum profile and various types of rollers in order to meet different needs, both constructive and flow. 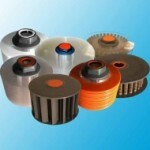 Pulleys, Rolls and Wheels in thermoplastic material, which ensure a longer lasting (compared to metals) and a greater lightness, thanks to their particular plastic composition (mixed materials), with consequent lower maintenance and downtime for replacement. 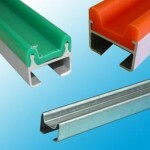 Available in different diameters and grooves, to satisfy all transport demand and also with bi-material rubbery coating to provide greater friction with the delivered product or to prevent its damage. 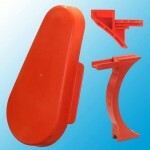 Other components in thermoplastic material.